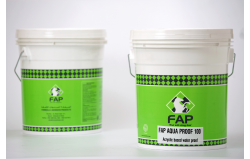 FAP AQUAPROOF 100 is a single pack flexible, elastomeric waterproof coating based on weather resistant pigments, filler and styrene acrylicester resins. It has excellent bond strength and fills and bridges hairline cracks. The cured membrane provides excellent resistance to carbonation and prevents chloride ion ingress. FAP India Chemical Solutions Pvt. Ltd.
CONSUMPTION/ COVERAGE Stir the liquid well before application and brush it on to the prepared surface. One litre will cover an area of 12 to 15 sq. mtrs. as an external coating. 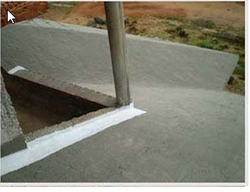 (Granite and marble bottom coat)Kan&Borgs’s water proofing coating for the base of marble, granite and natural stone to reduce water penetration.